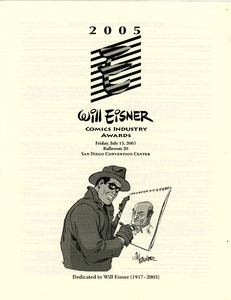 The Will Eisner Comic Industry Awards have been given annually at Comic-Con International: San Diego since 1988. Named for Will Eisner, the acclaimed and influential comics writer and artist, the awards are widely described as the "Oscars" of the comic industry. Each year, a panel of judges presents nominations for the award, and invite professionals working in the comics or related industries to vote for their favorites. Awards recognizing the best publications and creators in 30 different categories are announced at a ceremony open to all attending the Comic-Con in San Diego. VCU Libraries has served as the repository for the Will Eisner Comic Industry Awards since 2005. Every year following Comic-Con, dozens of nominated and award-winning titles are donated to James Branch Cabell Library and made available to researchers and visitors in Special Collections and Archives. Nearly 1,000 comic books, graphic novels, archival editions, scholarly titles, and journals are included in this rapidly growing resource, which is part of the Libraries' expansive Comic Arts Collection. The VCU Libraries' Comic Arts Collection began in the 1970s with the donation of a modest comic book collection and the papers of Richmond newspaper editorial cartoonist, Fred O. Seibel (1886 - 1968). Today, it comprises approximately 175,000 items, including more than 125,000 comic books. The collection also offers: papers and drawings of political cartoonists and related manuscript collections; many reference books and journals; science fiction, fantasy and comics-related fanzines; and original newspaper comic strip art. The collection represents many artistic styles, literary genres, time periods, and subjects and can serve as a source of ideas and inspiration.